Enjoy this nicely kept private vacation home in quite community of Clear Creek. 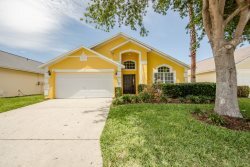 Home is located minutes from shopping and dining options and only 10 miles or less from most Disney parks. Home features multiple sleeping options for adults or children with two Disney themed rooms. TVs in living room and all bedrooms with Roku players. Large private pool backing to preserve for added privacy. Pool can be heated for an additional daily fee. Home is located on a cul de sac lowering vehicular traffic in front of home. Two en-suite bedrooms with private bath. *all prices subject to county and state tax of 11% total.